When you contact Dynamic Fan Corporation you will begin a process of outstanding service that is second-to-none in the competitive industrial fan industry. Dynamic Fan Corporation sets itself apart from others by providing prompt customer service from our knowledgeable and experienced staff. We serve our customer’s needs from design to manufacture and delivery as well as provide ongoing service and support. Housings for all DFC fans are continuously welded to be airtight and strong. Extra heavy-duty steel gauges are used for superior strength with heavy-duty angles and bars added to the case for additional stiffness and support ensuring vibration free performance. Inlet cone spinnings are designed for smooth acceleration of airflow into the wheel for optimal efficiency. Continuously welded and drilled inlet and outlet flanges are standard on all fans. All-welded heavy-duty steel bearing pedestals maintain accurate drive alignment. We use anti-friction pillow block bearings rated for 100,000 hours (L10) of operation. Fan shafts are turned ground and polished and selected for a minimum first critical speed 33% above the maximum fan speed. 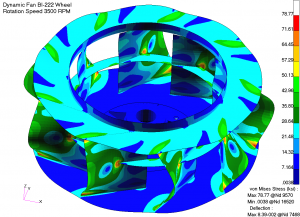 DFC fan wheels are designed using Finite Element Analysis and constructed using special high strength alloy materials when necessary. Stainless steel, aluminum, special alloy, high temperature, abrasion resistant and corrosion resistant construction is available for all fans. We have the capability to manufacture industrial fans and fan accessories to meet whatever challenges presented by your unique application or process. All DFC fans are inspected for quality, tested at operating speed and trim balanced to insure smooth trouble free installation and startup. ©2017 Dynamic Fan Corp. All Rights Reserved. Website Design and Development by Stellar Blue Technologies.